Have you ever noticed wild fluctuations in your website traffic that you couldn’t explain? If you check your Google Analytics, you’ll likely see a huge number of visits from referring sites, all at once. Then a couple days later: nothing. The cause: referral spam. In Google Analytics, referral traffic is when users come to your site via links from other websites, rather than from a search engine. 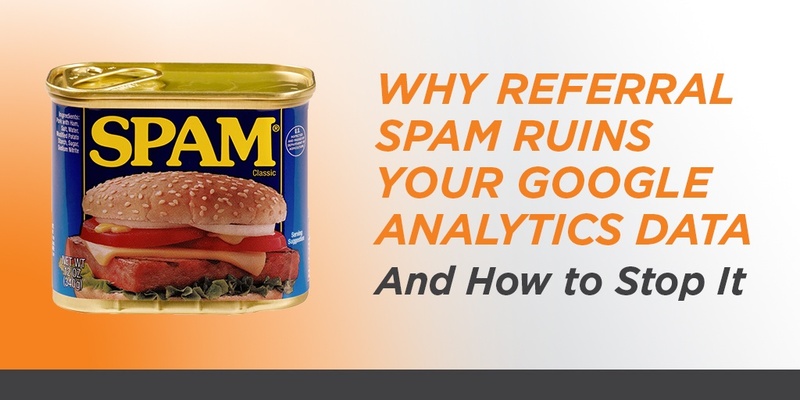 Referral spam is fake traffic – bots and spammers programmed to trick Google Analytics into thinking they are real people visiting your website. Sudden traffic spikes in Google Analytics are often caused by referral spam. There are a couple different ways that spammers do this. Sometimes, they use spam web crawlers that visit your site and leave fake referrals. However, the vast majority of referral spam never actually visits your site. Instead, spammers sneak data directly into Google Analytics that looks like real traffic. That’s why referral spam is often called ghost spam. Why do they bother? Often, they’re trying to create backlinks to drive traffic to their own websites. Imagine, if you see a strange referral site in your analytics reporting, you may be tempted to click it to find out what it is. Spammers are doing the same thing to thousands of other people, generating a ton of traffic to their websites. Sometimes these spam sites also contain malicious content, so it’s best not to click through to any suspected referral spam sites. What does referral spam mean for me? The problem with referral spam is that it causes large discrepancies in your website traffic. A large company’s website may see hundreds of thousands of sessions every single day, so a couple hundred spam hits aren’t a big deal. For a small business, however, a few hundred fake referrals are likely the majority of their traffic. 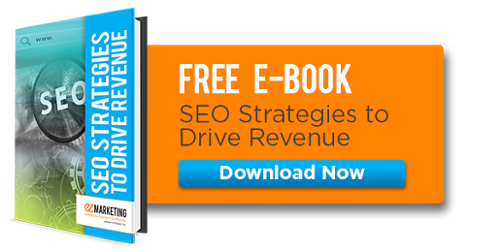 We’ve seen sites with as much as 90% of their overall traffic coming from spam. Not only does all this spam make it hard to find out how much real traffic you’re getting, it also skews your other metrics. Referral spam obviously isn’t high quality traffic, so spam will inflate your bounce rate and hurt your engagement metrics like pages/session and average session duration. How can I tell if my site has referral spam? In Google Analytics, there are two key reports to check for referral spam. The first is your Referral Traffic report, found within Acquisition --> All Traffic. Here, you’ll see the top referrers to your website. You should see things like news sites where you posted a press release, industry directories where you list your business, or blogs that are referencing your content. Sites like semalt.com, buttons-for-website.com and darodar.com are just a few examples of well-known spam referrers. 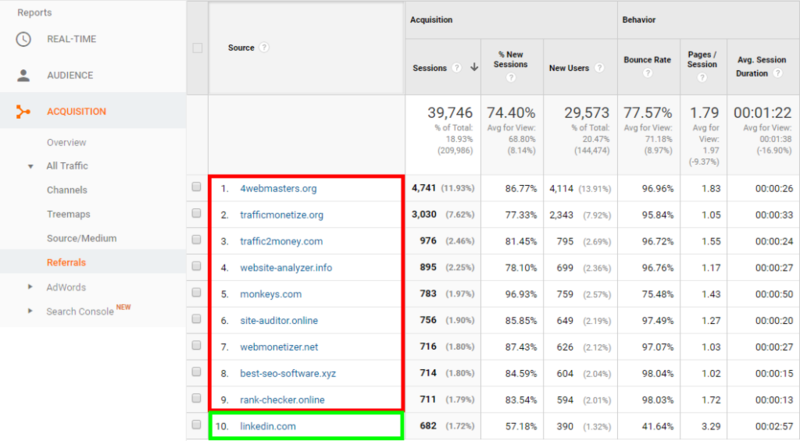 This Referral Traffic report shows significant referral spam (highlighted in red). The second report is the Hostname report, which you’ll find under Audience --> Technology -->Network. Then, find the option for Primary Dimension and click Hostname. This report identifies all the domain names that are triggering your Google Analytics tracking code. Nine times out of ten, this should be your own domain name. For example, to read this blog post, you visited this page: www.ezmarketing.com/blog/referral-spam-ruins-google-analytics. The domain name for that visit is www.ezmarketing.com. What about all the other hostnames that aren’t yours? A few a probably still valid, like Google’s translate services or e-commerce platforms. In most cases, though, other domain names are spam traffic that you’ll want to filter out. 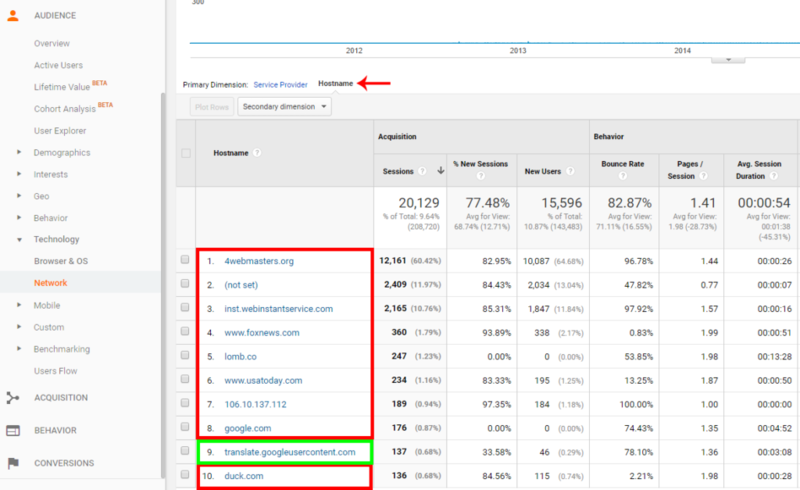 In this example report, translate.googleusercontent.com is likely the only valid domain name. The rest are spam. Don’t be fooled: spammers often spoof well-known website domain names like google.com or usatoday.com to make you think they are valid. If you know your way around Google Analytics, you can catch most referral spam with a couple of filters. There are a ton of resources out there for how to do this, but this Kissmetrics article gives great step-by-step instructions. Before tackling any changes yourself, we highly recommend creating a backup, unfiltered view of your data, so you don’t accidentally lose valid web traffic. To do this, go to Admin --> View --> View Settings --> Copy View. If you aren’t comfortable or don’t have administrative access to your Google Analytics account, you can always reach out to an SEO expert to help. We’ve been cracking down on referral spam for our clients lately – let us know if we can help you!